For awhile there, I was twittering. Sometimes it was a lot of fun, but a lot of the time I (and lots of other folks) wondered what the point was. That’s an excellent question and I’ve decided that there’s not enough of a point to it (for me anyway) for me to continue spending time with it. A way to write very short blog entries about things I wanted to share, but didn’t think merited a whole new post. For example, when I see a snapping turtle on my daily walk, I’d kind of like to tell you all that I saw it, but I wouldn’t sit down to write a whole entry about it most days. Twitter let me toss that off in 140 characters and it would show up on the sidebar here. I liked that I could share little thoughts and observations that way. But the navel-gazing nature of it (not just mine, mind you) annoyed me. So maybe I can figure out another way to “micro-blog” to this blog, without using Twitter. I’m going to try. A new challenge. On my last few days on Twitter, a twitterer I was following mused about setting herself a challenge to bake every recipe in The Bread Baker’s Apprentice. Regular readers here will remember that this is the book that brought us the irresistible pain a l’ancienne. Then she (Nicole) asked if anyone else out there in twitterdom was interested in joining her. After a time, I wrote to her and said I thought I might be interested. Well, at last count, there are about 80 of us home bakers around the world who are embarking on a project to bake every one of the approximately 45 recipes in the book at a rate of one recipe per week. 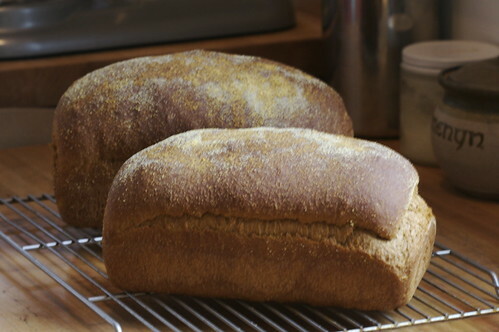 Nicole has set up a page outlining The Bread Baker’s Apprentice Challenge on her own, terrific blog, Pinch My Salt. I don’t know if we’ll actually bake all the recipes. I don’t know if we want to. 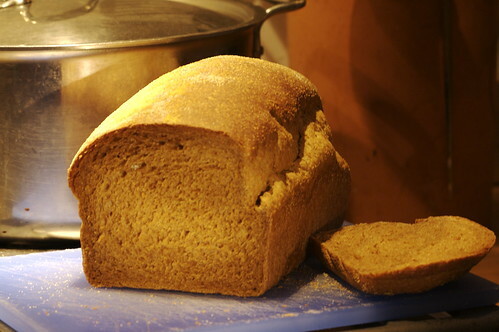 But I baked recipe # 1, Anadama Bread, this week – and it’s delicious. Stay tuned for bread #2 next week. Nooooooo! No HobNob on Twitter anymore???? I’ve seemed to have reached a point where it’s not longer a micro-blog platform for me…. Your bread looks yummy! It has such a nice, dark crust. I really need to get on with writing my post and putting up pics. Thank you!! Hope yours turns out well, too. Glad to hear it was a winner – I’m making it in a couple days! Excellent! Let me know how it goes. I’m ready to plunge into the 2nd recipe, but am trying to wait so I can stay on schedule with the main group. I’ll be baking along with you.